Each keyword belongs to its own universe – explore it with these 2 tools! My name is Scott, a Sr. SEO Specialist at Exclusive Concepts and today I’ll be covering a few different approaches on performing keyword research to uncover additional semantically-related terms to incorporate in your keyword and content strategy. 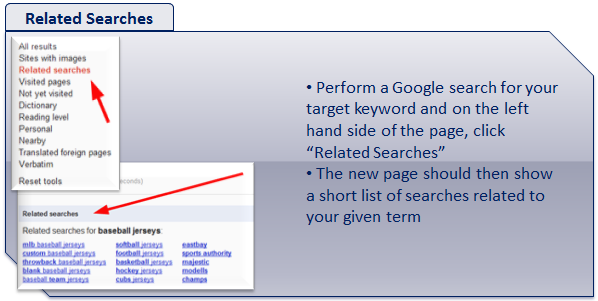 One method of finding relevant keywords is by doing a standard search on Google for your target phrase and then clicking the “Related Searches” link on the right hand side. Doing so should bring up a new page with a short populated list of related search queries. In this case you’ll notice that I started with “baseball jerseys” and the Related searches link then brought up other keywords like “MLB baseball jerseys”, “custom baseball jerseys”, etc. With this new list, I could find other keywords to incorporate in my content and on-page optimization that would further support the overall theme and also show Google relevance towards other terms applicable to my baseball jersey business. The next method is a very cool tool that I found through Mike King’s blog (http://ipullrank.com/how-to-uncover-100s-of-new-longtail-keywords-in-minutes/). Ubersuggest (http://ubersuggest.org/) utilizes the familiar Google Instant suggestions we’ve all seen and expands it out to over 200 keywords. Once the keyword list is generated, you can then click the “Get” button on the page and copy and paste the list into Excel or another program for further evaluation. When I’ve used this tool, I generally pull the data into Excel and then use the Google Keyword Tool (https://adwords.google.com/o/Targeting/Explorer?__c=1000000000&__u=1000000000&ideaRequestType=KEYWORD_IDEAS) to generate search volume to further evaluate my list based on relevancy and demand. Incorporating analytics and/or ranking of each keyword can also help in your evaluation.